Preheat a pan over high heat. Add 3 tbsp of herb and garlic infused oil to the pan. While the oil is heating, season both sides of the fish with salt and pepper. Place the fish in the pan and cook over high heat for about 2 minutes or until the flesh has caramelized and has released from the pan. Flip the fish and cook over high for another minute. Baste the fish with the herb oil using the oil in the pan or by adding more. Place the pan into the 350 degree oven and bake the fish for another 4 minutes, until the mahi mahi is just cooked through and still moist. 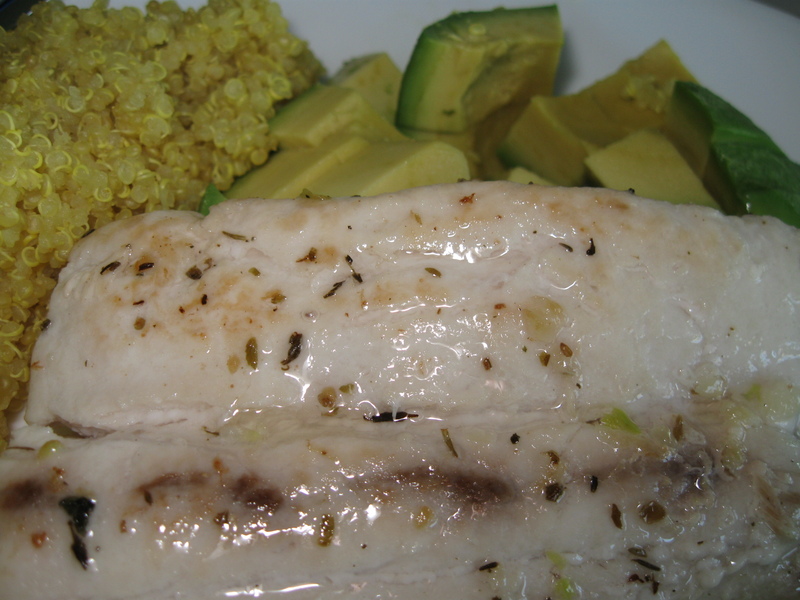 Remove the fish from the oven and serve with the avocado salsa. Garnish the dish with a drizzle of infused oil. (The picture is a slightly modified version for my husband.) I served this with Quinoa Pilaf and avocado.